Home Tags Posts tagged with "jeremy wuitschick komo"
Jeremy Wuitschick, a brave seventh grader from Milton, Washington, said he was “acting on instinct” when he jumped up to stop his school bus after the driver passed out behind the wheel. Jeremy Wuitschick, 13, was on his way to school with about 15 other students yesterday when he realized something was wrong. When the bus started veering toward the curb, the teen sprung into action. Jeremy Wuitschick told the network: “I just went up, grabbed the wheel and turned it right and took the keys out of the ignition. The teen said he shouted for anyone on the bus to call 911. That’s when another seventh-grader, Johnny Wood, told Jeremy Wuitschick that he knew CPR, and performed chest compressions on the driver. 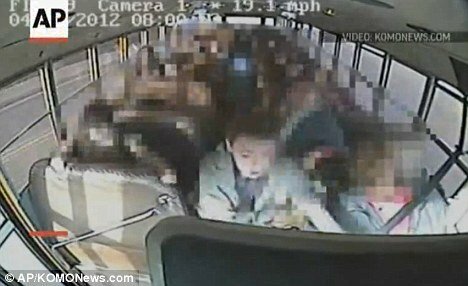 Video from the bus’ surveillance camera shows Jeremy Wuitschick and the other students acting in an extremely calm manner. Local authorities said they were planning to reward Jeremy Wuitschick for his quick-thinking. ABC News reported that the bus driver, who was not identified, was rushed to nearby St Francis Hospital in grave condition.